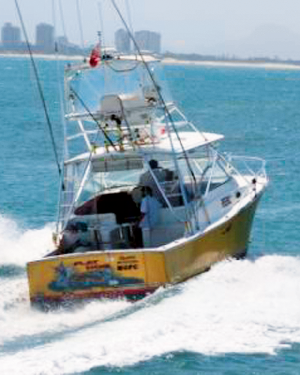 Flat Dog is a custom built game boat carrying all modern equipment. The local crew have more than 40 years combined experience in these waters. Because Flat Dog is in survey for 6 pax; you will receive more hands-on attention to help you enjoy your adventure even if you are a novice or an experienced angler. Special events & corporate bookings welcome. 1/2 & full day fishing in the rich prolific blue waters off Mooloolaba. Includes all rods, bait & tackle. Departs The Wharf, Underwater World.